Idaho National Laboratory has been named a 2017 Digital Edge 50 Award winner by IDG Enterprise in recognition of its High Performance Computing immersive 3D visualization capabilities. Selected by a panel of industry experts and business and technology executives, the annual Digital Edge Awards recognize innovations in technology used to transform traditional methods of solving complex problems challenging the effectiveness of industries such as energy, health care and agriculture. The 50 winners will be honored onsite at the AGENDA17 conference, March 20-22, at Ponte Vedra Beach, Fla.
A team composed of INL researchers, data scientists and technology specialists designed and developed the capability to fully immerse a scientist into a highly interactive virtual environment capable of generating complex scientific models and simulated scenarios. The team’s goals included delivering a visually immersive and robust virtual experience enabling scientists to interact with their environmental surroundings while experiencing and simulating events. The immersive experience improves access and mobility through the use of consumer technology, keeping costs at a minimum. INL possesses a four-sided 3D Computer Assisted Virtual Environment (CAVE) in the Applied Visualization Laboratory at the Center for Advanced Energy Studies. It allows scientists and engineers to probe, analyze and predict trends while standing in the midst of computer-generated renderings of their designs. 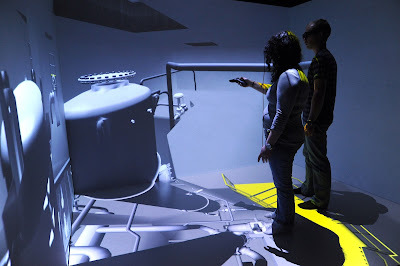 Scientists also desired access to 3D modeling and simulation capability within their unique research environments, including use in the field. In order to develop a solution that researchers could adopt to perform modeling and simulation analysis outside of specialized facilities, such as the CAVE, they evaluated standard game engines, modeling applications and consumer technology. As they selected technology, scientists and technology experts collaborated closely to model facilities and simulate events measuring outcomes with scientific precision. Once they cleansed and layered INL’s Big Data, it was transformed using gaming platforms and modeling software and ultimately delivered into the hands of scientists and staff through Samsung’s Gear VR®headsets using several platforms, including PCs, Macs and standard smartphone technologies. “They are taking advantage of new capabilities to enhance their mobile and analytics practices worldwide,” said Digital Edge Program Chairwoman Anne McCrory, adding that innovations in technology produce dramatic results and allow quicker and more efficient customer service. Co-sponsored by CIO and Computerworld, the Digital Edge Awards recognize 50 organizations for digital transformation initiatives with significant, measurable business impact. Through digital technologies such as mobile, analytics, AI, the Internet of Things and cloud, award winners see business results that indicate a true “digital edge.” Winning entries span more than 15 industries and seven countries outside the U.S.